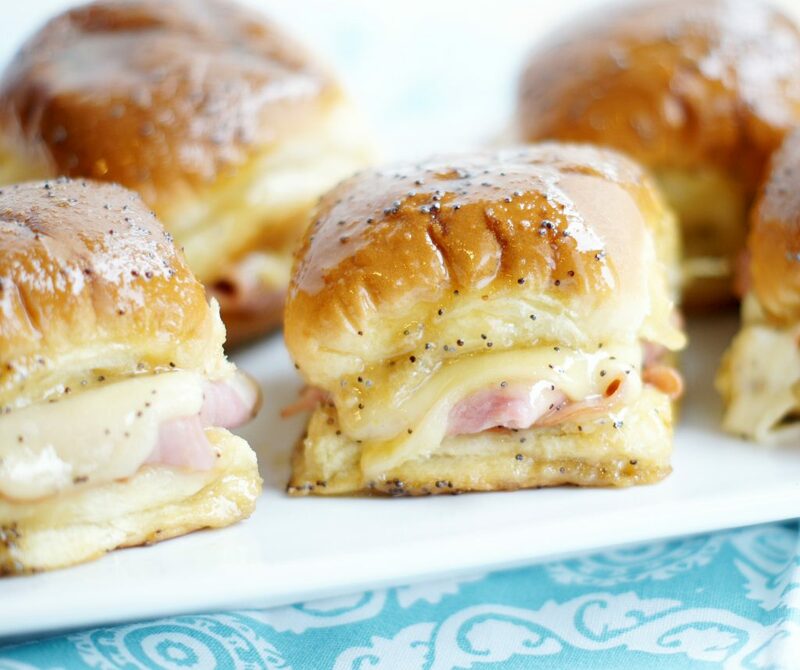 Layers of ham and Swiss cheese nestled in soft, sweet Hawaiian rolls with a sweet & savory buttery topping. These sliders are out of this world. You’ll make them time and time again. 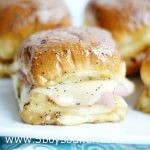 These caramelized ham & swiss sliders seem to have been a regular in our dinner rotation the last few months. We can’t seem to get enough of them. 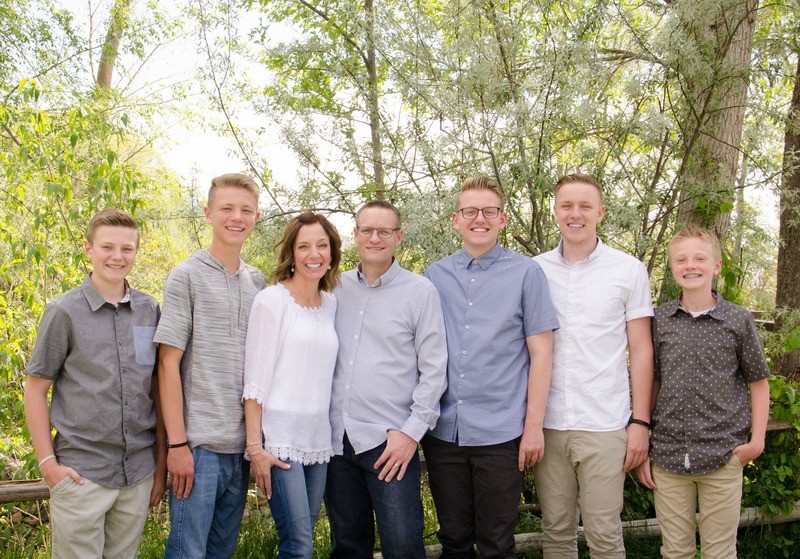 They are seriously the bomb! They are one of those things you could eat yourself sick with because they are so good it’s hard to stop at just one. You’ll be licking your fingers and find yourself going back for a second and then a third. They are dangerous I tell you! So quick and simple to make, and absolutely delicious. I made a ton of these for my son’s 16th birthday party awhile back and everyone went crazy over them. 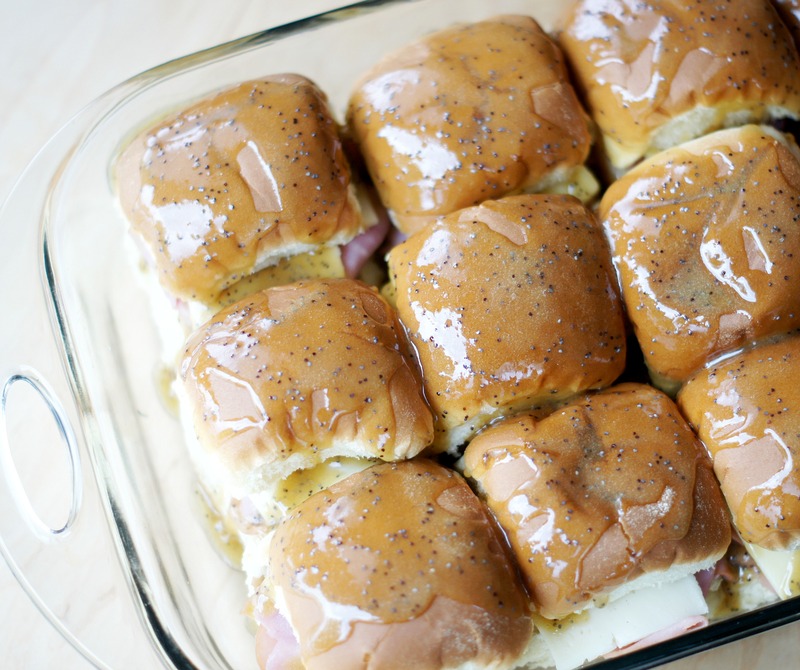 The sweet Hawaiian rolls are piled with ham and cheese and then you pour a sweet & savory butter sauce over the top. Cover them with foil and bake. The sauce caramelizes and the cheese melts and these turn into some pretty fantastic (and addictive) sandwiches. Just look at them. Don’t you wish you could reach through your computer and grab one right now? I do! Maybe we’ll be having these for dinner again this holiday weekend. I’m pretty sure there won’t be any complaints from my boys. Spray a 9 x 9 or 9x13 glass dish with non-stick cooking spray. Set aside. Preheat over to 350 degrees. Spread roll bottoms with horseradish sauce (If using). Fold up pieces of ham to fit the rolls and place them on the bottom halves of the roll, next place 2 squares of cheese; replace tops and place in a single layer in the prepared pan. In a small skillet, heat butter over medium-high heat. Stir in remaining ingredients. Pour over rolls. Cover with foil and bake covered, 20 minutes, remove foil and bake 5 more minutes. *These can also be made ahead of time. Just cover with foil and refrigerate for several hours or overnight. Bake as instructed. I've used the Kings Hawaiian Rolls and the Sara Lee. I like the Sara Lee Brand because they are slightly bigger, but either brand is delicious. If you use the Kings Hawaiian brand, you can probably fit them in a 9x9 pan, but the Sara Lee fit better in the 9x13. If you are using the horseradish, just spread a small amount. I love the flavor it gives these sandwiches, but too much gives them a bit of a kick. I make some with and some without because my boys don't like horseradish (surprise, surprise). 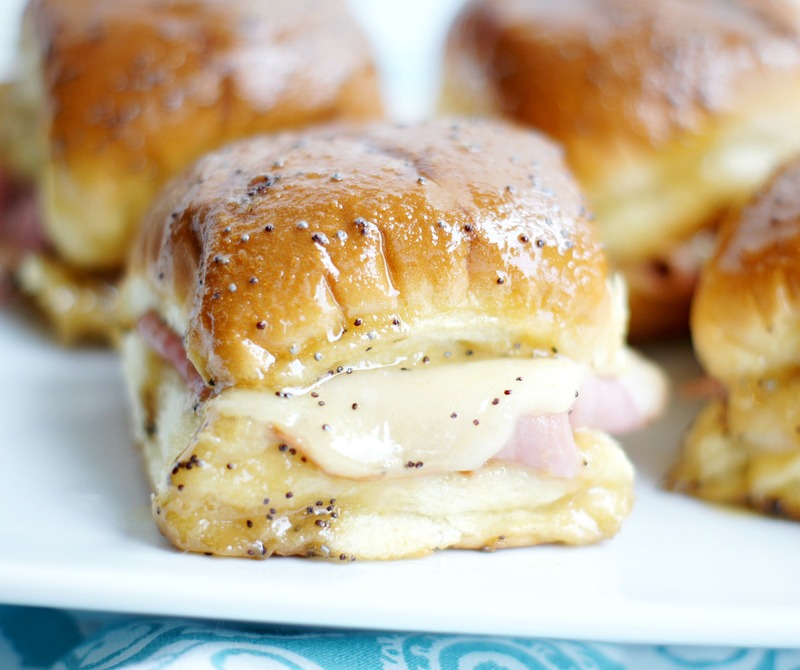 We love these with provolone cheese and havarti cheese too! I want to reach through the computer to grab ALL of them. These sliders look delicious!! Pinning. Thanks Thao! They are so delicious. I could honestly eat them everyday! These are just what I was looking for to serve my family as part of our father’s day lunch. Great recipe, thank you! Thanks for looking Ashley. I hope you have a chance to make them. They are amazing! These little sandwiches are the best! Thanks for linking up with What’s Cookin’ Wednesday! Added an omelette in the middle and just had them for breakfast!! Yum! Yum! That sounds delicious! What a great idea, I think I’m going to have to try that. Thanks for looking! makes me want to lick my computer screen! Hi there! Was the only change you made to the original recipe is using onion powder instead of onions? I think so Bryanna, but I can’t remember for sure.